The new Godzilla trailer opens with the sounds of Bryan Cranston's scientist freaking out, but really, the aural pleasure for monster-movie fans comes in the screaming roar of the giant reptile himself. Debuting online Tuesday, the second bit of fresh footage of director Gareth Edwards' upcoming Godzilla flick fleshes out more of why there's a gigantic atomic-powered beast wreaking havoc in the oceans, toppling cities and leaving the Statue of Liberty armless and in need of a makeover. 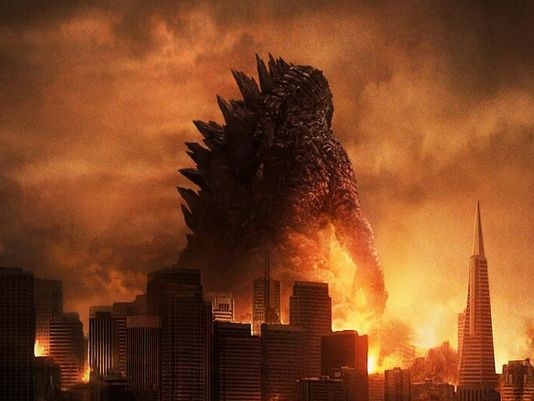 As it turns out, the Japanese were trying to take out the thing in 1954 — the same year as the first Godzilla movie — with nuclear blasts but that just turns out to irk Godzilla more than actually hurt him. Godzilla back in the day was a wrecking machine, but that one was delicate when compared to the new movie monstrosity, who annihilates subway trains with gusto and laughs off missiles launched at his scaly skin. "The arrogance of man is thinking nature is in our control," intones one of the Japanese scientists played by Ken Watanabe. "And not the other way around." You said it, buddy. Edwards is still keeping a full-on body shot of the big star of his movie (in theaters May 16) hidden from audiences, but he does give us a clear shot of his back — and the many spiky armored structures on it — and a few seconds of Godzilla's intimidating maw before a door shuts, keeping us safe at least until the next trailer. In the meantime, for those who love Godzilla's new roar, Warner Bros. Pictures has it on a SoundCloud for download if you want to have it as your new ringtone.